$400,000 in sales in 48 hours — just off of Facebook friends? No ads!? Unbelievable, but true. Hear how Michael Devlin generated almost half a million in 2 days. He also reveals how he helps others hit 6 and 7 figures on Amazon without even having a product yourself. Michael shares tactics to successfully sell online, through Facebook, and on Amazon! – How Michael launched a course about selling on Amazon. 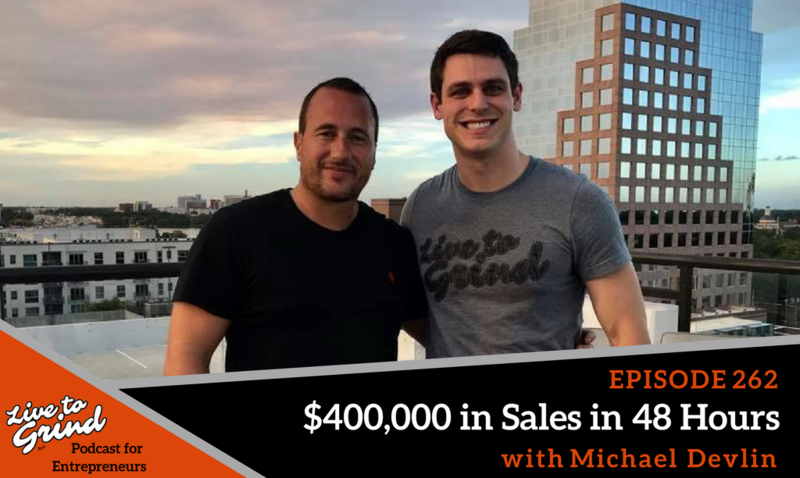 – How Michael shared his digital course on his personal Facebook page and brought in $400,000 in 48 hours. – BONUS: Michael will be speaking at the Live to Grind event Dec 8-10, 2017! Get your tickets now. – How Michael teaches others how to bring the perfect product to market. – Michael’s goal to take 100 brand partners to a million dollars in revenue. – Building your list of customers. – Where to monetize your content. – The importance of impacting others and offering value. – Michael and Brandon talk about the keeping the entrepreneur mindset. – Michael shares how you should give your product a personality and be authentic. Michael Devlin is the founder of Mass Conversions & Profits Engine. He is an award winning digital marketer with almost a decade of experience having built multiple seven figure e-commerce platforms and generated over £5M in sales in the UK and $14M for his clients in the US. Check out Michael‘s Mass Traffic Webinar.